Yep. That's the end of BGC. I doubt any other channel would pick it up...MTV maybe but other than that no. I dont think mtv would pick this up, if it did it would be Vh1. It fits right in with the other "trashy" shows like the love and hip hop franchises. But im going to wait till its actually official, as I remember around season 13 they said the same exact thing that they were moving oxygen in a different direction. I see BGC coming back somewhere.... I feel like its too much of a "staple" series at this point that can draw in easy numbers..... we'll see though. Oxygen is dumb as **** for real though; Sisterhood of Hip-Hop was also getting somewhat decent numbers from what I remember. I'll give it a year & a half (being generous) before the channel as a whole is gone. Wym about waiting to it's official, this from a press release from Oxygen itself. It's not continuing on the network at least at this moment because the creators from Law & Order bought the network from NBC. Yeah. Can't get any more official than that. I see BGC coming back somewhere.... I feel like its too much of a "staple" series at this point that can draw in easy numbers..... we'll see though.Oxygen is dumb as **** for real though; Sisterhood of Hip-Hop was also getting somewhat decent numbers from what I remember. I'll give it a year & a half (being generous) before the channel as a whole is gone. I hope they at least do some sort of big reunion special to send it off. E! and Bravo are both owned by NBCUniversal so I wish they would just move Bad Girls Club to one of those networks instead of cancelling it. 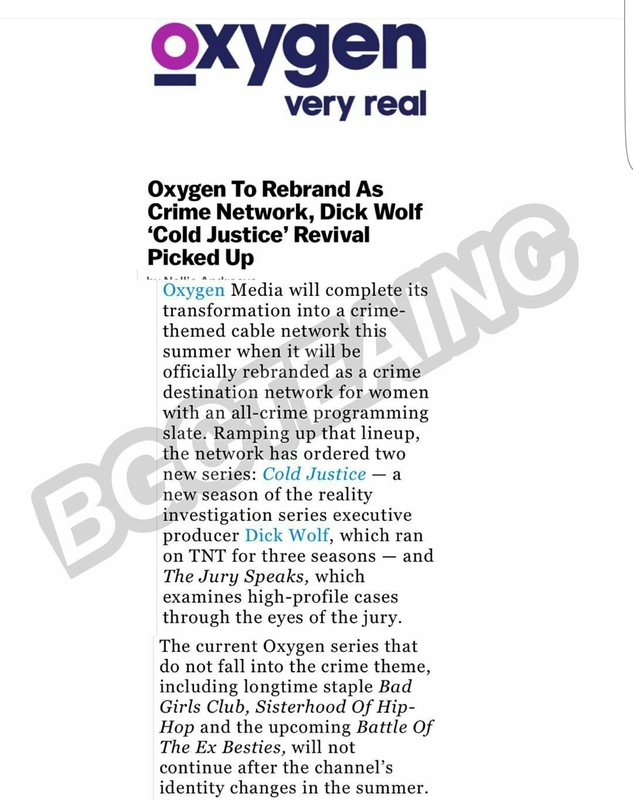 Oxygen as a crime channel will still flop because it can't compete with Investigation Discovery. Unless they can completly revamp it somehow (like ANTM which is actually doing okay), i dont see anyone picking it up. The themes aren't working, All Star didnt work, Love Games is done..what other things could they do to make it watchable and unique again? Just let it die, y'all. The show doesn't need revamping at all the new themes have been working and the show was just rebuilding it's audience back up. The show originally flopped due to the jumping and because they were doing the seasons back-to-back while now they put a decent break between them. The would definitely survive on a network like Bravo or VH1 where they know how to actually promote their shows but I don't care if they decide to keep it or not. C'mon BET! GURL, you saved The Game...you know you can get BGC to season 20 and RUN IT INTO THE GROUND, *****! YASS! Cause my best friend finna...she finna...OOOH! C'mon BET! GURL, you saved The Game...you know you can get BGC to season 20 and RUN IT INTO THE GROUND, *****! YASS! Cause my best friend finna...she finna...OOOH! Aside from that New Edition movie and the award shows BET is still a sinking ship. They need to take whatever they can to save that network. entrepreneur wrote:C'mon BET! GURL, you saved The Game...you know you can get BGC to season 20 and RUN IT INTO THE GROUND, *****! YASS! Cause my best friend finna...she finna...OOOH! GIRL...they is BOUGHETTO...Ok? I'D SO BE HERE for them making "Hip Hop & Luv" to get them some coins...Y'all know the cast would be Keyshia Cole and Booby Gibson and a bunch of nobodies...but that's ok. But you right....wit they BOUGHETTO *****, I can see them thinking they TOO GOOD cause BGC would be a boost...**** Jerry Springer reruns would be a ******* boost for they ***** rn. *Yeah, I don't see us getting a reunion, which I'm sure makes BMP happy since RW30-32 ain't have one. Don't cast members get paid extra to attend? I think I saw Seven saying she needs to get paid a pretty coin to take off of work to do a reunion with the wack ******* of the season. I could definitely see BET taking Sisterhood of Hip-Hop though. It would only make sense. I think people will be fake-outraged about how BET renewing Bad Girls Club is a "bad look" for AA people & will create all types of petitions to get it cancelled again. Im lowkey stanning Fran she seems like she doesn't back down. Love Seven, Shay, and Susan. I didnt really like anyone. Seven seems cool, though. They're filming the reunion right now as we speak. 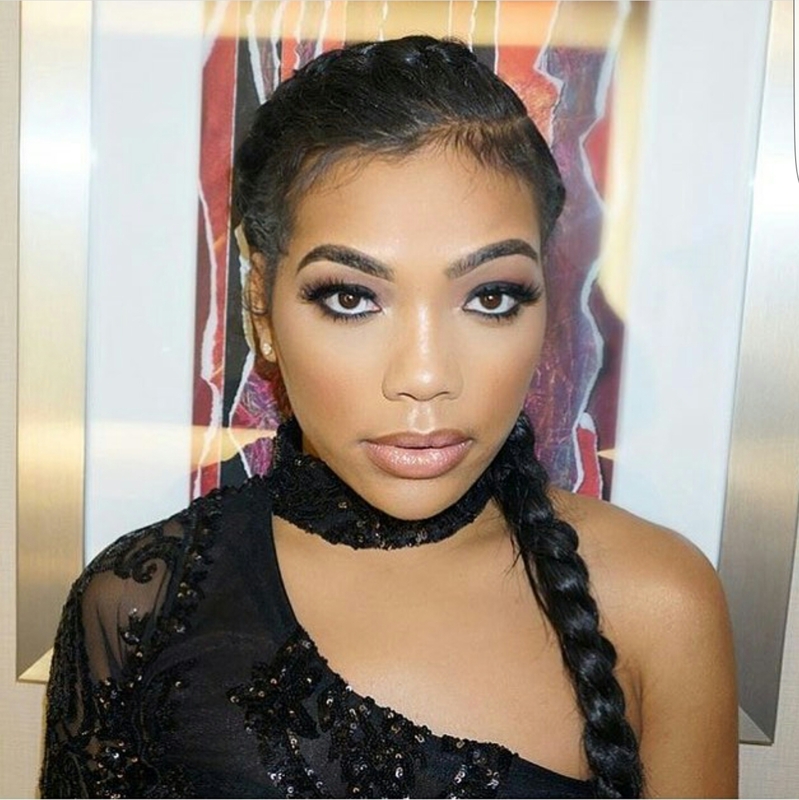 Tanisha is back for the final reunion and also Erica Mena is an official co-host this time.